Blustery Britain will be hit by wet and windy weather tomorrow with gusts of 70mph possible in coastal regions. Heavy rain and gale force winds will sweep from south-west to north-eastern regions during Friday afternoon, following a deceptively quiet start to the day. 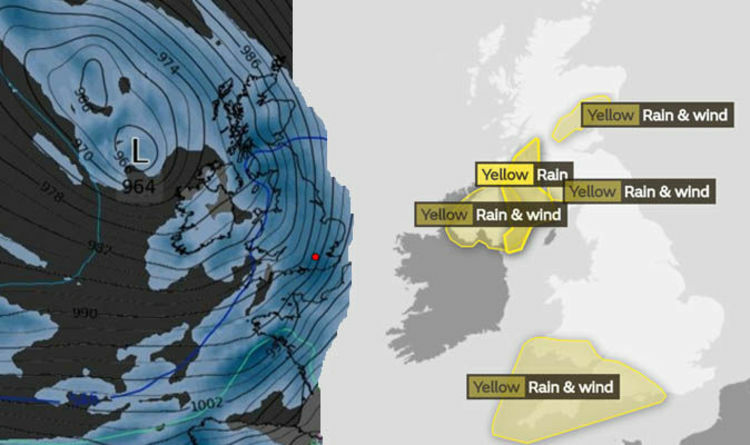 The Met Office has issued a yellow weather warning for Thursday (November 8) and Friday (November 9) when heavy rain and strong winds will sweep across Northern Ireland, Scotland, Wales and the south of England. Flooding of homes and businesses is likely in all regions and downpours are expected to cause chaos for those travelling by roads, with drivers warned of severe delays. Trains may be cancelled and ferries could be disrupted as 60mph gusts batter coastal areas. Where will be affected and when can they expect wind and torrential rain? Extreme weather is set to affect Northern Ireland, south west Scotland from 4pm on Thursday to 4am on Friday morning. Downpours in these areas are likely to cause flooding and 40mm of rainfall may lead to treacherous roads and delays to travel as well as cancellations to trains and ferries. Winds of up to 60mph could strike coastal areas. For those travelling by road spray and flooding from rain will mean difficult driving conditions as well as road closures. Torrential rain and strong winds are set to drench South Wales, south west England and parts of Scotland from 1pm on Friday to 11.59pm that evening. Power cuts and flooding could affect some areas with coastal regions particularly at risk. Central, Tayside & Fife, Grampian, London & South East England, Northern Ireland, south west England, Strathclyde and Wales should brace themselves 15-25 mm and gusts of of 60mph. A Met Office forecaster said : “A band of heavy rain is expected to move east during Friday with widely 15-25 mm of rain falling and perhaps 50 mm over higher ground. The Met Office’s weather warnings are colour-coded depending on how severe the forecast is. They range from yellow (when the weather is likely to cause low-level impact and travel disruption) to red when dangerous weather is predicted. A red weather warning is the most serious kind of weather warning the Met Office can issue and means it is likely that the weather will cause damage - for example, to buildings and roads.